Hillsdale House Inn: The Right Whales Are Coming! The Right Whales Are Coming! A recent news report indicated that there will be 39 right whale calves swimming at their mothers sides as they make there way north to the Bay of Fundy for another summer season. 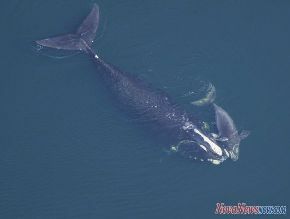 This is very encouraging news considering that the right whale is still on the endangered species list. If you have not yet enjoyed the experience of getting up close and seeing these amazing mammals in their natural environment you must plan to take advantage of this exceptional opportunity. The whale watching excursions operated along the Digby Neck & Islands are some of the best you will find anywhere in the world. We are currrently offering a package in partnership with Ocean Explorations "Zodiac" Whale Adventures. Not only do you get to see some of the most amazing creatures on the planet, but you will also experience the excilerating adventure of doing it in a Zodiac. The best time to take advantage of this opportunity is between early July and early October. For more details on our package offer Click Here and check out the Whale & Seabird Adventure "Inn" Style package. Have you ever seen a Luna Moth?